This week, the International Business Machines Corp. (NYSE: IBM) stock price has gotten a reprieve from what has been a long, painful downtrend, as it looks to break above new five-month highs. 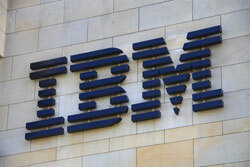 After touching off $154.28 a share on March 13, the IBM stock price has been climbing. At yesterday's close (Monday), it was up to $164.63 – 6.7%. It's up 3.3% on the year. It got a big boost yesterday on news that Big Blue was going to refocus its strategy in China. CEO Virginia Rometty confirmed that IBM was going to work with local Chinese tech firms to build out their IT infrastructure by sharing technology, Reuters reported. But that's not the only positive development coming out of IBM. Last week, IBM also began shipping its newest mainframe model, the z13, to its business clients. IBM earnings show that over the last 11 quarters, the company has seen declining revenue. Among its hardest hit segments was hardware, which has seen revenue fall 12 consecutive quarters. That's why the z13 is so important right now. The last three years have seen IBM's hardware sales fall from close to $6 billion to $2.4 billion – a drop of almost 60%. This came largely as a result of where IBM was in the mainframe product cycle. The z12 was nearing the end of its run and IBM's business clients were anxiously awaiting its next model. Mainframes make up about a third of IBM's hardware sales, Mike Chuba, a mainframe analyst at Gartner, told Money Morning. It's no wonder that sales were seeing a decline. And the z13 can only be good news at this point for a struggling IBM. The z13's big selling point is its ability to process mobile transactions with the security characteristic of IBM products. 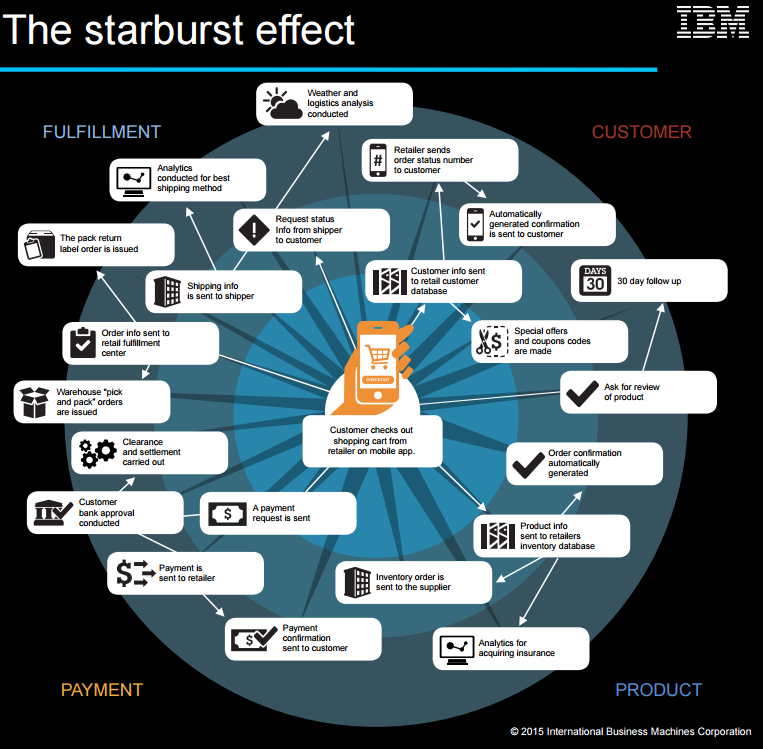 An online mobile transaction triggers anywhere from 4 to 100 accompanying transactions in what is called the "starburst effect." 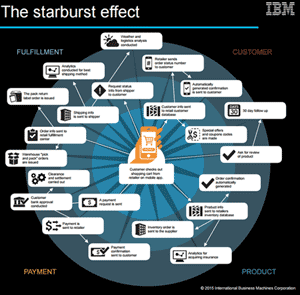 The diagram to the right, from IBM, charts just how exhaustive this cascading effect can be. That puts a lot of pressure on back-end systems processing transactions. The z13, with the unmatched computing power typical of IBM mainframes, is designed to process an extremely high volume of mobile transactions – 2.5 billion a day, or 100 Cyber Mondays. This is all with the security that comes with the mainframe. With the IBM-China partnership, and a product cycle refresh, IBM is making strides to reverse its troubles over the past couple years. But don't be so quick to jump in on IBM stock just yet… It's still too early to recommend IBM as a "Buy." I was trying to do research on the reason for the quick rise in IBM stock. I have been there and usually with large corps when prices jump the CFO has sold off departments that affected the price of the stock. Nothing on it. Good to see IBM is getting back to its creative roots and lead what the global market needs not what they want the customer to buy. Over my 40 years in communication and IT I have seen many corps trying to make the shifts and stock for the demand and train its services departments.